When wine aficionados talk about California wine, it’s more than likely they’re discussing the world famous wineries that are well north of our fair city. Santa Monica’s Pourtal aims to change that way of thinking with Made in Malibu, a wine tasting series that explores Malibu’s burgeoning wine region, or American Viticultural Area (AVA). The goal for the month-long series is “to spotlight some of our favorite California wines, all of which are produced right in L.A.’s backyard,” says Pourtal owner Stephen Abronson. The exclusive wine tasting tour will feature a flight of ten wines crafted solely from grapes grown in the Malibu AVA. Pourtal’s high-tech Enomatic machines will be busy dispensing tastes through the month of January. Each wine is priced per 1 oz. pour, and guests are welcome to sample at their own pace. Two additional Malibu wines will be available from Pourtal’s by-the-glass list. 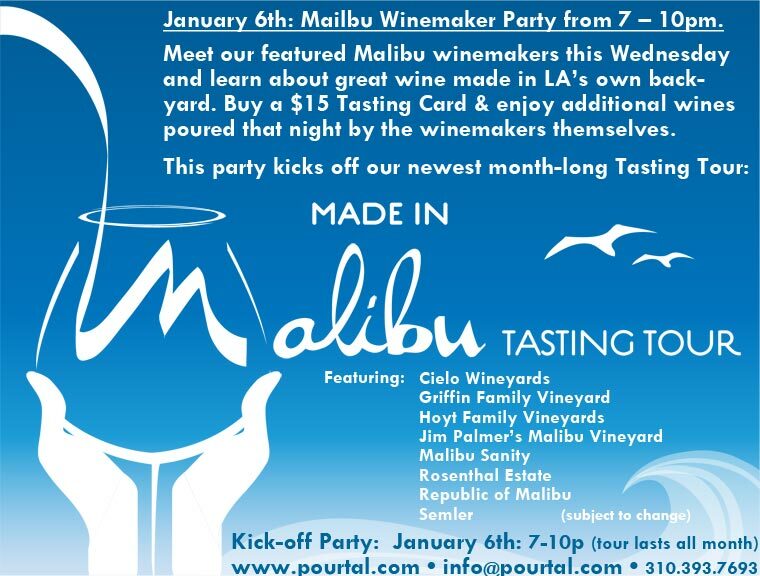 Made in Malibu debuts on Wednesday, January 6 with a launch party honoring the winemakers. Representatives from each of the featured wineries will discuss their wines as well as hand-pour an additional wine. Pourtal will provide hosted appetizers for guests. Admission to the launch party is free. The hand-poured tastings are free with the purchase of a $15 Pourtal tasting card, which may be used for pours from the Enomatic machines at any time. Throughout the month, Pourtal will also host select Malibu wineries for a special series of hand-poured tasting events. Each winemaker will present several off-the-list wines to taste, as well as have a few bottles available for purchase. The tastings are free to guests with the purchase of a $15 Pourtal tasting card. NOTE: Dates and times for the special tastings are subject to change. For the full schedule of tasting events, please visit Pourtal’s website. Available any time during regular business hours. Launch Party: Wednesday, January 6th, from 7-10pm. Update 1/19: Tonight, you can support the Haiti earthquake relief effort by drinking wine. From 7pm to closing, Pourtal will donate 25% off all tasting sales on Tuesday night to the Santa Monica chapter of the Red Cross specifically for the earthquake relief in Haiti.